← Malcolm Crowder Leaves Us; May He Rest In Peace. Gary Pipher Speaks: I have included a couple more pix for you. As you might have known our company was responsible for supplying the exploration equipment and many times the expertise to run large projects around the globe. One interesting project was the removal of Ripple Rock in the Seymour Narrows just off Maude Island and north of Campbell River in British Columbia , but the photos I have attached here were from the beginning days of the large Hydro project at James Bay called La Grande 1 and La Grande 2 situated on the La Grande River at James Bay . I was on the project several times overseeing the commissioning of the many pieces of equipment we supplied for the project. 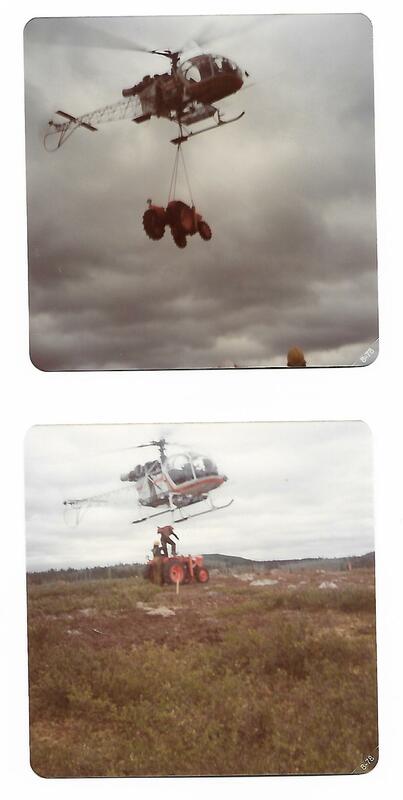 Transportation was mostly by helicopter to all areas since roads were none existent. The one photo from the chopper was of the La Grande River prior to any construction taking place. I recall the old Newfield tractors mainly because at the time we had to import them from England and something to do with the percentage of contents of equipment having to be from Canada or I guess the British Commonwealth and tractors such as the one shown under the chopper were the order of the day . Stan Speaks: Gary now in Retirement, maintains the road to his cottage. The two pix at top are of Gary on his “favourite Newfield” and one of the Semi Trucks used to haul the gravel he spreads with the “Newfield”. 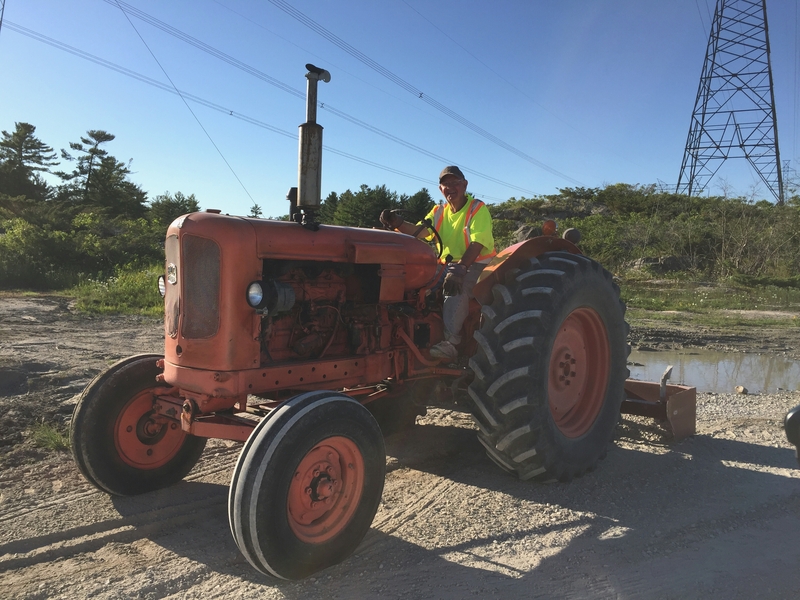 Gary Speaks: I have always looked after sections of our cottage road and have rented road graders and what ever was available at the time , but this summer I had an opportunity to purchase the old Newfield tractor. It does quite well and it just takes a little longer to do what a large road grader can do. But one advantage of being old and retired is that we seem to have a lot of spare time on our hands. 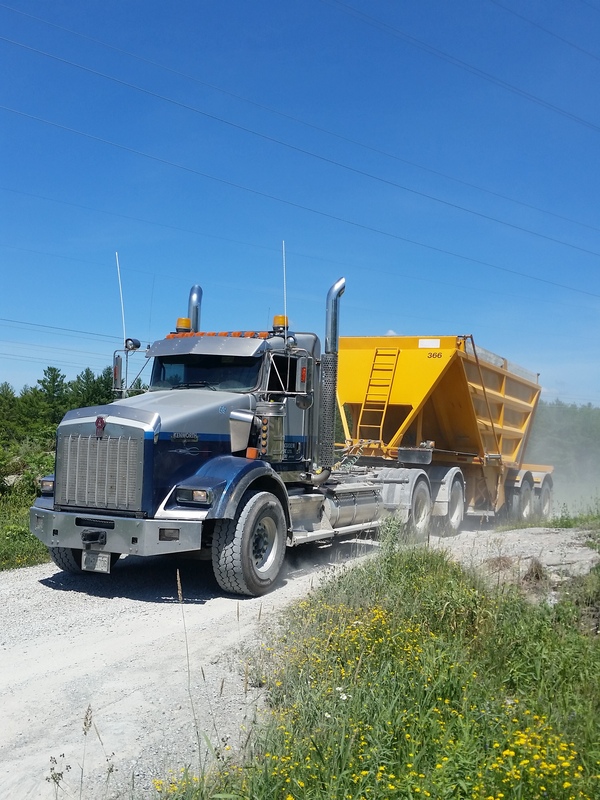 In the spring of the year when the 1/2 load restrictions are removed from the township roads I have large trucks haul the gravel from a quarry in Orillia to our various cottage roads. One of the trucks misjudged the space available for turning around and it was a costly day for him to say the least. We had to get Currie towing from Barrie (formerly from Elmvale) to bring their heavy towing equipment in to put the truck back on the road again. Stan Speaks: Thank You so very much Gary for this fine motivating story!! Please remember, if YOU have a Story, as most of us do, please send it along. Send to Stanistheman_200@yahoo.com Stan: 2018 09 27. 1 Response to Did Your Working Experience Prepare You For Retirement?? Tell Your Story!! Gary Pipher Shares His Story. “Great story Gary”. Rendall says to tell you that we had a Newfield tractor on the farm. Glad to hear you are still operating it. The cottage owners are lucky to have you living on their road.